On this date in 1598, the indigenous Guale youth called Lucas was hanged by the Spaniards in St. Augustine, Florida, for his supposed part in the prior year’s massacre of five Franciscan missionary friars during a 1597 Guale revolt. The key primary source for this event is Luis Jerónimo de Oré’s text The Martyrs of Florida, from approximately 1619. 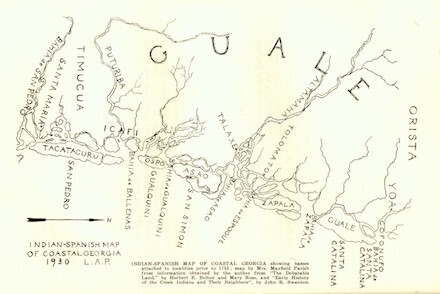 (Here’s a public domain English translation) The titular “Florida” as claimed by Spain in the New World colonization scramble was a much larger territory than the present-day U.S. state, peninsula, and running Internet gag; hence, the Guale territory relevant to this post lies on what is today the Georgia coast. Ore informs us that “an Indian youth, who was a Christian and heir to the caciquedom,” was incensed when the Franciscan resident at the settlement of Tolomato presumed to disallow him a second wife. This cacique and two other Indians, like him, given to the same immoral practice, went into the interior among the pagans, without saying anything or without obtaining permission as they were wont to do on other occasions. After a few days they returned at night with many other pagan Indians, painted and smeared with red paste, and with feathers on their heads. This among them is a sign of cruelty and slaughter. Thus fearsomely attired, they burst upon the hut of the prudish Fray Pedro de Corpa and butchered him, setting up his head on a spear. Having done this, the angry cacique — who is known only as Juanillo, which is sometimes the name given to this rebellion — ordered other Guale to treat their nosy proselytizers likewise. As a result, four other Franciscans — Fray Miguel de Aunon and a lay brother on St. Catherine’s Island, Fray Bias Rodriguez at the mission village of Santa Clara de Tupiqui, and Fray Francisco de Verascola on Asao — were all murdered within days. A couple of other missionaries had very close escapes. Map of the relevant part of the Georgia coast. Besides these, a Fray Francisco de Avila was kidnapped and held hostage for ten months. Although cruelly tortured, Avila would survive captivity and produce a narrative of his own, one that Ore includes wholesale in his volume as a standalone chapter. In the course of the ensuing Spanish raids on the Guale, the Spanish captured seven boys or young men and interrogation zeroed in on one of them: the son of the cacique of Tupiqui, who appeared as a possible participant in murdering Fray Bias Rodriguez. Lucas was reticent on the point but after being subjected to the water torture he allowed that “he arrived in time to see Fray Bias die,” and this confession of his presence sufficed to condemn him. He was the only person judicially executed in the course of the entire revolt. In view of said declarations of these proceedings, the crime falls upon Lucas the Indian, son of the Cacique de Tupiqui, for having been present and participated in the killing of Fray Bias, who was sent to convert the people of Tupiqui. I must condemn him by this my decree, sentenced according to his declaration, with the penalty of death. The justice which I order shall be done him is: That when he leaves the jail where he now is, it shall be with a rope around his neck, his hands tied behind him, and with a loud voice it must be proclaimed to the public his crime; that he be taken to the gallows, already prepared for this purpose, and that there he shall be hung by the neck and strangled until dead. Because, thus is it well to punish with real justice those who dare to commit such crimes, and as an example to the other Indian natives of these provinces that they may not commit similar crimes. So do I pronounce sentence and command. And if the said Lucas is not mindful of receiving baptism and should not die repenting, and in the Catholic faith, I order that he be hung and after his death his body be burned to powder. Interpretations of the whole affair have always been driven by Ore’s narrative: either the surface reading of it, that Juanillo and company found monogamy irksome and preferred, in Ore’s words, “to give rein to their sensuality and unlawful pleasures”; or, a converse take for the era of decolonization, that the cultural interference of the Spanish empire triggered a native backlash for whom the friars were the ready-to-hand targets. In either version, the rebellion flourishes briefly but ultimately fails. Francis in his book and the video above offers a very different reading: as a successful revolt authored by a different cacique, Don Domingo of Asao, who violently renegotiated the local balance of power** and thereby displaced the caciques of Tolomato as the paramount chiefs of the Guale. As a particularly gruesome coda, Domingo made successful obeisance to the Spanish and obtained the crown’s blessing for an expedition to destroy Juanillo, whom he blamed for the disturbance. After capturing the rebels’ last redoubt (beheading Juanillo in the process), Domingo ordered the surviving women to scalp their own men. Now that is paramount chiefdom. Domingo appears to have maintained his preeminence among the Guale for the balance of his years — backed by and partnering with the Spanish, to the happiness of evangelizing clerics who were never more disturbed. A few years later, the Spanish even plopped down a new mission in his very own native soil … Santo Domingo de Asao. 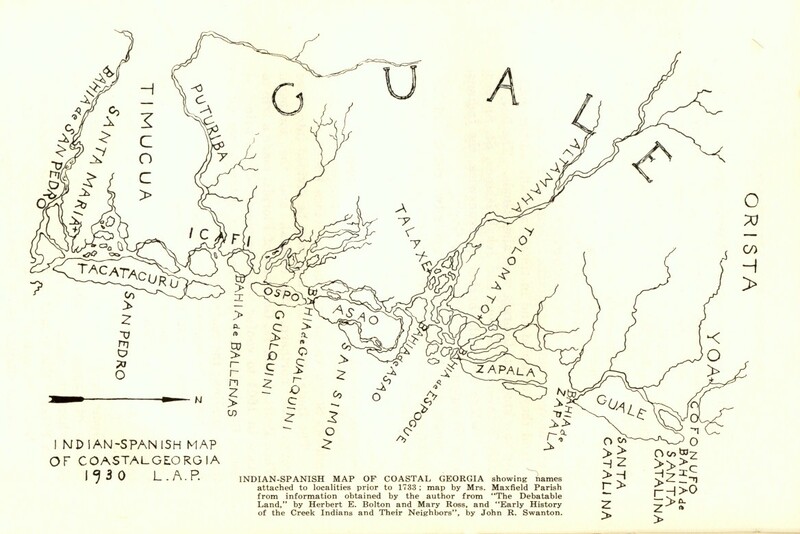 * The Guale people are thought to have been subsumed into the Yamasee.